January is the month when many people make resolutions, which usually include weight loss goals for the coming year. People are also making resolutions to take steps toward reducing their physical pain. The relationship between weight loss and lower back pain is more dynamic than people may realize, and it’s frustrating to begin a new exercise routine only to have to stop due to pain. At Arrow Physical Therapy and Rehabilitation in New Jersey, we want to help you achieve your weight loss goals while also helping to relieve your lower back pain. While exercise is a wonderful thing, if done incorrectly, it can activate your lower back pain, which may hinder your weight loss journey. Our team of certified physical therapists specializes in creating personalized treatment plans to help you lose weight and relieve back pain, all at your own pace and by utilizing your own strengths and lifestyle. Contact our team today to learn more about how we can help you. Weight gain can lead to lower back pain by compressing the lumbar spine in the lower back, which often results in a pinched nerve that leads to pain and other symptoms. People who are overweight and currently experiencing lower back pain may find that weight loss achieved by exercising regularly and healthy eating habits, may relieve some of the lower back pain. In some cases, a new exercise routine may increase lower back pain. Exercising improperly or too vigorously may irritate the pinched nerve in the lower back, causing the lower back pain you are experiencing to increase. Various aspects of your routine such as your posture while lifting weights, how you stretch, or even the frequency and intensity of your workout program can all be factors when it comes to arising back pain. Because it is important to keep your momentum going when you are trying to lose weight, you should contact a physical therapist to help you find an appropriate exercise regimen that will help you lose weight and treat your lower back pain simultaneously. If you are suffering from lower back pain, a physical therapist may be able to help reduce the pain and symptoms you are experiencing. A physical therapist is able to recommend specific stretches and exercises, and make sure you are doing them correctly in order to prevent further injury. Other therapies such as massages and heat therapy may also be recommended to help reduce your lower back pain and symptoms. If your lower back pain is not going away within two weeks of rest, contact a physical therapist to find a treatment plan that works for you. Arrow Physical Therapy and Rehabilitation in New Jersey wants to help you keep your resolutions of weight loss and find some relief from your chronic lower back pain. If you are in the Woodbridge, Edison or Union area of New Jersey, and you are experiencing lower back pain, contact our physical therapy office near you today to schedule an appointment or fill out the appointment request form on our website. 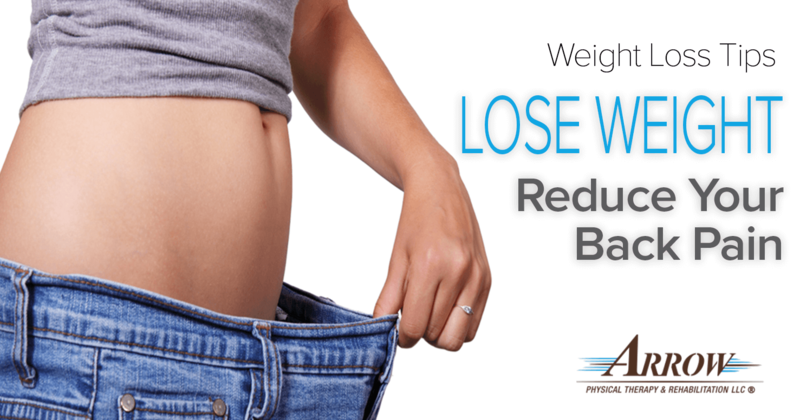 We are here to help you find a personalized plan to lose weight and reduce your lower back pain symptoms. Contact us today!